The Hillsound Ice Traction line is one of the best on the market. They have been tested in the Himalayas! The Hillsound Trail Crampon is a necessity for added traction when out hiking on the local trails or deep in the backcountry. Tested on the trails of the Himalayas, the Hillsound Trail Crampon is guaranteed to handle diverse winter terrain and weather conditions. Utilizing an ergonomic plate system, this crampon provides excellent traction and reduces muscular fatigue for your winter wilderness pursuits. 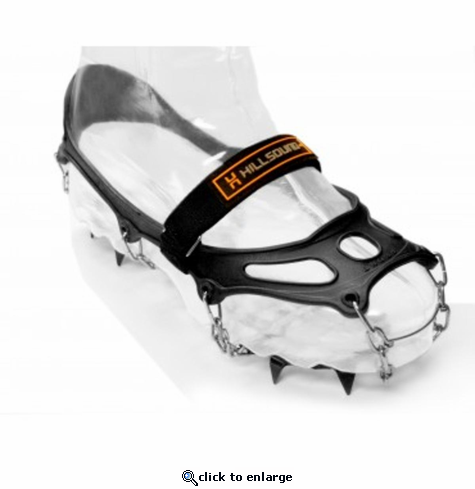 Hillsound Equipment Inc.'s crampons and traction devices are designed to provide improved traction in snow and ice conditions. This traction device is not suitable for technical ice climbing, steep terrain or mountaineering. Hillsound products do not eliminate the risks associated with snowy and icy conditions and cannot prevent all slips and falls. When wearing Hillsound products, always use caution, extreme care and common sense. Failure to do so could result in injury or death. The user alone is responsible for determining whether his/her experience, combined with the equipment, terrain and weather, present a risk. The user alone assumes responsibility for the safe and proper use of this product and any risk associated with its use. Activities involving the use of this equipment are inherently dangerous. Hillsound is not responsible or liable for any loss, damages, injury or death caused by the use of this or any other Hillsound products. LIMITED WARRANTY: Hillsound crampons have a 2-year warranty against damage due to poor workmanship and/or defective materials excluding normal wear and tear, oxidation, alterations and modifications, damage by mechanical force, improper storage and maintenance and uses for which this product is not designed. In the event that the Hillsound product does not perform as listed, the user shall notify Hillsound of any such defect within 90 calendar days from the date when the defect was observed. The user's sole and exclusive remedy shall be limited to the correction of the defect by adjustment, repair, replacement or refund, which shall be at Hillsound's election. SAFETY INSPECTION: Before each use, check over the product to ensure there is no damage, such as chains splitting open or tears in the rubber. If damage is found, discontinue use to prevent further damage and potential injury. Please return the product to your local Hillsound retailer. Test product before each use for proper fit. Check positioning of front & rear spikes on the outer sole of your footwear. All spikes must fit within the outer edge of your footwear when fitted properly. FASTENING & REMOVING: Always put on and remove Hillsound Trail Crampon while seated. To fasten the Trail Crampon place toes into the front section of the crampon and adjust so the toe guide wire is sitting in front of the shoe not on top or underneath the shoe. The spikes must sit untangled and position well within the outer edge of your footwear underneath the ball of the foot. Pull the rubber back-tab toward the heel and cover your footwear with rubber evenly positioned around the sides of your shoe. Pass the velcro strap under and over the opposite side of the rubber to prevent slippage of the crampon. Adjust the chains and base plate appropriately so that the base plates are fitting evenly and squarely underfoot. Place one foot at a time to ensure balance and start walking on flat surface to test that it is fitting well. If the chains or rubber are loose, you may need to consider a smaller size for a tighter fit. All shoe makes and brands are different, so the Hillsound sizing chart should be used only as a guide. To remove the product, slide the back-tab off of the heel of the shoe, and slip the front of the foot out of the front section of the crampon. PROPER APPLICATION: Hillsound Trail Crampon are designed for recreational activities such as trail running, winter hiking, and are not made for technical climbing. These are not a mountaineering crampon. Avoid using the Hillsound Trail Crampon on stairs, rocks or river crossings. Only use Trail Crampon in winter snow and ice conditions. Use the Trail Crampon with regular outdoor footwear, such as: runners, hiking boots, and insulated boots. SAFETY TRANSPORTATION: Transport crampons using a sturdy bag so as to protect the spikes from damaging personal belongings. Always position the spikes away from the body when transporting them. CASE AND MAINTENANCE: After each use crampons must be thoroughly cleaned, dried and stored in a cool dry place. The chains are stainless steel and so will not rust, however the carbon steel base plate can. To prevent rust they can be oiled after use and drying. These things are amazing. I cannot believe how much more confident and less fatiguing it is to have these on in snowy slick conditions when out hunting. Very excellent product that I highly recommend. ProsVery well made. Durable. Works better than imagined.